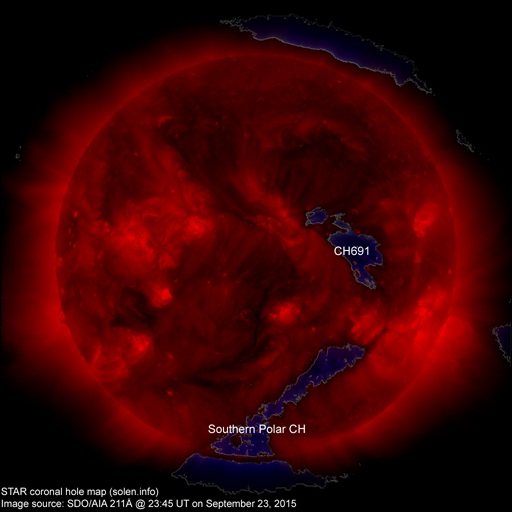 Last major update issued on September 25, 2015 at 05:45 UT. The geomagnetic field was quiet to unsettled on September 24. Solar wind speed at SOHO ranged between 399 and 510 km/s. 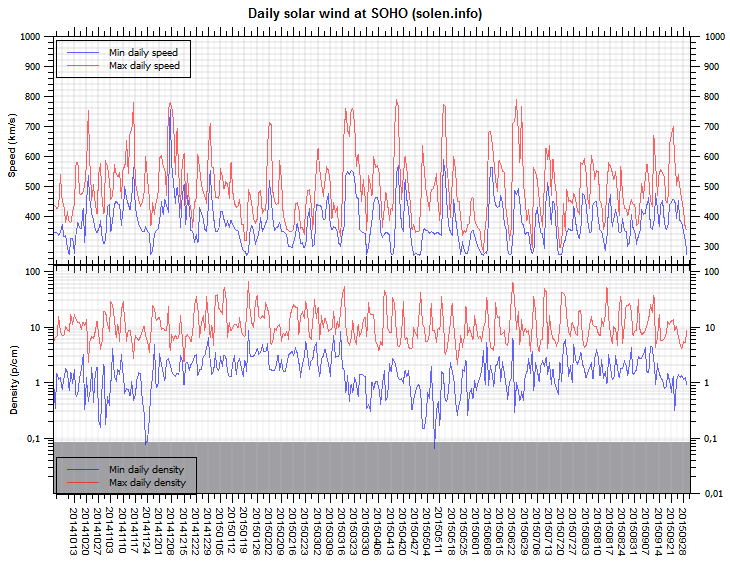 Solar wind speed increased slowly towards the end of the day. Solar wind temperature increased to a level often seen during high speed coronal hole streams, however, as I write this it is still uncertain if we are inside the stream from CH691. 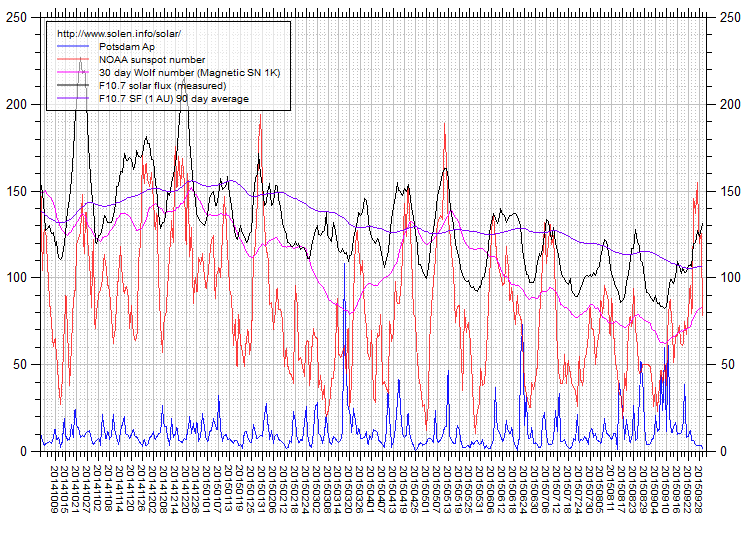 Solar flux at 20h UTC on 2.8 GHz was 106.8 (decreasing 2.3 over the last solar rotation). 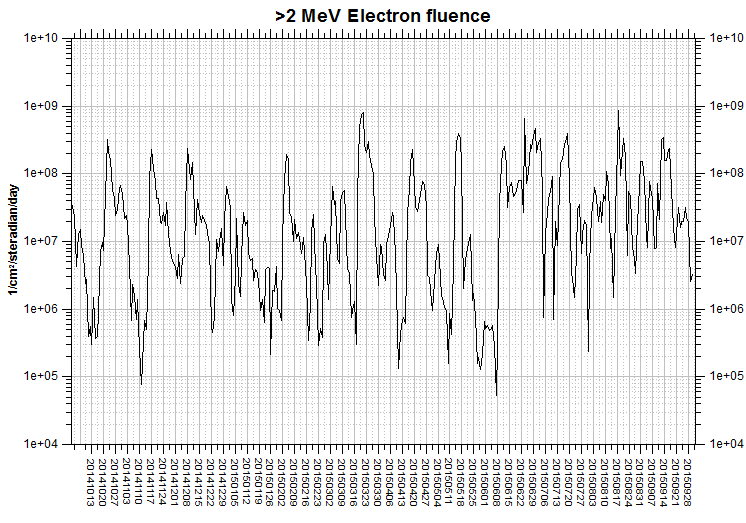 The 90 day 10.7 flux at 1 AU was 105.6. The Potsdam WDC planetary A index was 6 (STAR Ap - based on the mean of three hour interval ap indices: 6.5). Three hour interval K indices: 32211122 (planetary), 34212222 (Boulder). At the time of counting spots (see image time), spots were observed in 10 active regions using 2K resolution (SN: 225) and 9 active regions using 1K resolution (SN: 158) SDO images on the visible solar disk. Region 12418 [S15W75] was quiet and stable. Region 12420 [N10E20] was quiet and stable. 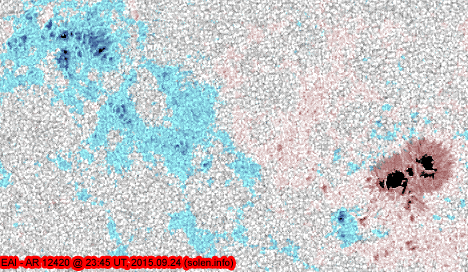 Region 12421 [N15E06] developed significantly during the latter half of the day as new flux emerged. A small magnetic delta formed in the north. 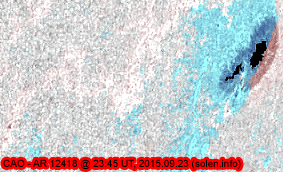 Further C flares are likely, Should the region continue to develop there will be a chance of minor M class flaring. 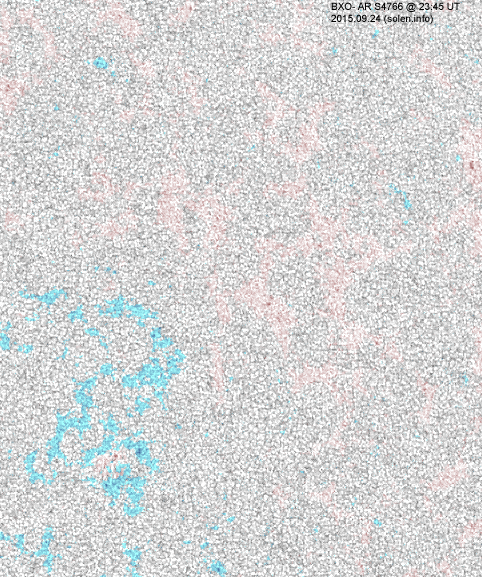 Region 12422 [S20E26] gained spots and penumbral area as slow development continues. 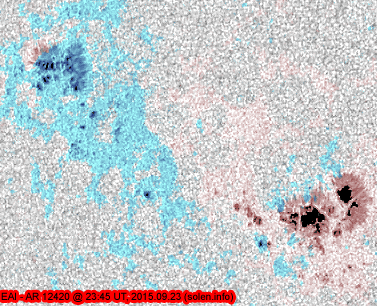 C flares are likely and a minor M class flare is possible. 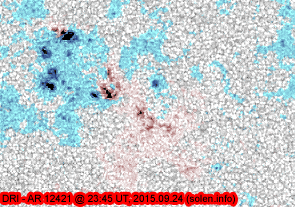 Region 12423 [S09W23] developed slowly and quietly. S4766 [N17W21] was quiet and stable. S4772 [S13W46] reemerged with penumbra spots. S4778 [S05E13] developed slowly and quietly. New region S4779 [N17E62] emerged with several spots. New region S4780 [N30E49] emerged with a few spots. 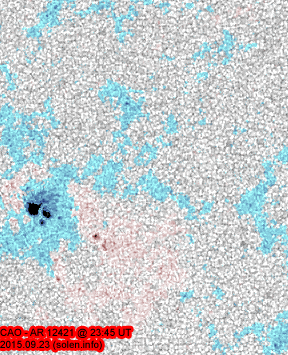 A bipolar region was observed at N46E33 at midnight, however, the spots were too diffuse to be counted. 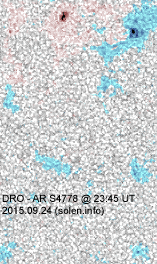 September 22-24: No obviously Earth directed CMEs were observed in available LASCO imagery. The geomagnetic field is expected to be quiet to unsettled on September 25 due to effects from CH691 and quiet to unsettled on September 26-27.